In 1739, a workhouse costing £500 was built in West Street, Poole, with money provided by Thomas Missing who later served as the town's Member of Parliament. A parliamentary report of 1777 recorded a parish workhouse in operation at "St James in the Town and County of the Town of Pool" with accommodation for up to 80 inmates. Dorset: Canford Magna, Hamworthy, Kinson, Longfleet, Lytchett Matravers, Lytchett Minster, Parkstone, Poole St James. Later Additions: Branksome (1894). The population falling within the union at the 1831 census had been 11,052 - ranging from Hamworthy (population 308) to Poole itself (6,459). The average annual poor-rate expenditure for the period 1832-35 had been £5,216 or 9s.5d. per head. The new Board of Guardians met for the first time on 7th October, 1835. The following August, a plot of land at Longfleet was purchased and advertisements for plans were placed in The Times , The Dorset Chronicle , The Sherborne Journal , and The Salisbury & Winchester Journal . The following January, the building committee met to examine the eleven sets of plans that had been submitted. Although Mr JH Clarke of London was initially chosen as architect, the final plans appear to have been drawn up by local man John Tulloch of Parkstone. The new workhouse had a square design and was built 1838-9 at the southern end of St Mary's Road, Longfleet. The site location and layout can be seen on the 1924 map below by which time the workhouse was officially known as Poole Poor Law Institution. Poole main accommodation block from the west, 1970s. Cullingford (1988) catalogues some of the Guardians' early orders for workhouse supplies — "3 dozen bolsters, 50 large knives and forks and 50 small knives and forks and 50 iron spoons." Contracts for provisions were also placed with: "James Boyt, for bread of best seconds at 7½d. per 4lb loaf; with John Frampton for Beef at 4d per lb by the Quarter, Mutton and suet 5½d. per lb, Pepper 10½d. per lb, Bohea Tea, 3s.1d. per lb, Starch 5½d. per lb; with G.G.Roe for Treacle at 5¾d. per lb, and oatmeal at 24/- per hundred weight, with A. Lawrence for Green Bacon at 58s. per side per cwt; with B. Vines for candles at 6/3 a dozen; with John Whittle for Best Eden main coals at 20/9 per ton; with John hatcher for Blue Potatoes £2-15-0 per ton, and White do. at £2-12-0; and with John Goff for Men's shoes at 4/6, Boys over 12 3/9, Under 12 3/-, Girls over 12 3/-, under 12 2/6 per pair." 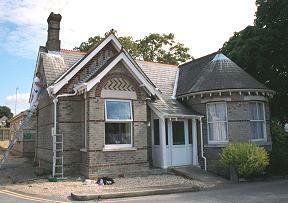 In 1903 an infirmary, designed by HFJ Barnes of Poole, was added at the north of the workhouse. In 1909, new casual wards were added. 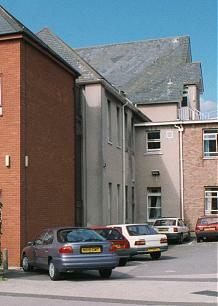 Poole workhouse infirmary from the east, 2000. 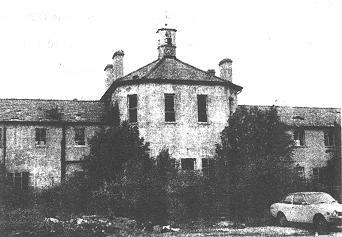 The institution later became Longfleet Publica Assitance Institution, then after 1948 as St Mary's Hospital. After standing derelict for several years, virtually all the workhouse buildings were demolished in 1979. All that now (2000) survives is the former lodge at the south of the site, the much-extended 1903 infirmary, and a few small outbuildings. The site is now occupied by a maternity unit. Poole workhouse lodge from the south-east, 2000. By the 1920s, the Poole Union was operating two scattered homes for pauper children at Broadstone, with a combined capcity of 38 places. The Matron of the home was Miss A. Smith. Dorset History Centre, Bridport Road, Dorchester DT1 1RP. Holdings include: Guardians' minute books (1835-1930 with gaps); House Management Committee minutes 1895-1930 etc.